Hey there! Tuning in with a premiere for our mates at Majestic Casual Records. As I always say - it's always great to see familiar names joining forces together. 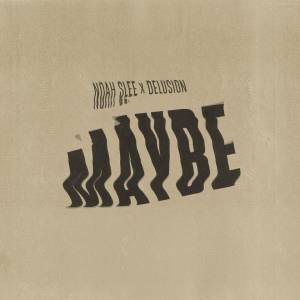 One of the prominent names in the Berlin contemporary r&b/soul scene - New Zealand-via-Berlin Noah Slee and German producer Delusion craft an upbeat and bouncy track called "Maybe". While the tune is just a bit over 2 minutes, it just does not let you feel restless. The feel-good ambiance takes over the very second you hit the play button and won't let you chill until the end. Nothing, but good vibes! Maybe' plays with the energy you get when you meet someone and there's an instant connection. As long as I have been single (a while now) every encounter feels more distant and lost. When I met this guy it was different. Maybe is about the grey zone, the uncertainty, the leap your waiting for the other person to take because you don't want to. All these things you take into consideration in such a small amount of time about someone and maybe disguise it with other things to protect yourself from taking a relationship to the next step. Simplicity of something like love can be pretty complicated. Maybe is about pursuit of connection. Working with Delusion felt natural. He is attentive and has a chilled energy. Sharing ideas back and forth was easy. Although it was a compact few days in the studio we made sure to have fun, drink wine and make the best music we could. He was on production duties and we also had some friends participate with minor details (guitar, lyric). Hope this puts you in a good mood, guys. Cheers!